What kind of mother does this to her own daughter? I stared into the mirror and watched Mum run her hands through my long brown locks. I look just like her, I thought as she started to plait my hair. We had the same colour eyes and hair, and we liked the same things, too. "The apple doesn't fall far from the tree," relatives remarked when they saw Mum and me standing next to one another. Some people couldn't even tell our voices apart on the phone. Each night we'd cuddle up together on the lounge to watch our favourite show, A Country Practice, while Dad and my two brothers joked with each other in the background. But when I was 12, Mum started to act strangely towards me. One day I came home from a friend's house 10 minutes late. Mum stood in the doorway, screaming like I'd committed some horrendous crime. "Where the hell have you been?" she thundered. I trembled with nerves. This wasn't the happy-go-lucky mother I knew. 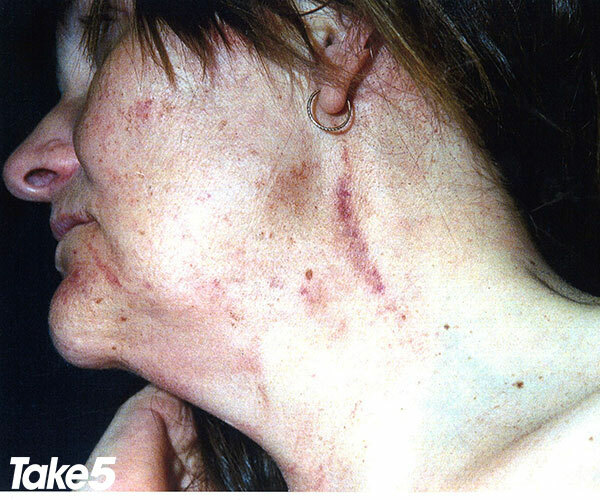 Want to hear what the Take 5 team have to say about this shocking story? Listen to the Take 5 Ripper Real Life podcast! As she continued roaring, I realised Mum was serious. I hurried off to my room, too scared to venture out. Next morning, I hoped it had all blown over, but Mum's moods continued. "You're useless," she snarled when it was just the two of us. I fought back tears at her harsh words but soon I couldn't take it anymore and started to cry. "Stop it!" Mum yelled, whacking me over the legs with a broom handle. This kind of thing became more common whenever Dad and my brothers were out. I racked my brains wondering what I'd done to deserve her anger but couldn't think of a single thing. Once I left school, I met a man and moved out. By then, I was relieved to be free of Mum. "It won't last," she snarled when I told her my plans. But I was young and in love. Then, one day, police turned up on my doorstep. "We're here to investigate a report," an officer began. They'd received a call from someone saying that my boyfriend had been violent. "But there's nothing wrong," I insisted. Visits from the cops became more and more frequent until finally my boyfriend had enough of having the finger pointed at him and left me. Faced with being homeless, I turned to my parents. "Come home, darling," Mum soothed, like I was a little girl again. I wondered if I'd imagined her earlier outbursts because she was so caring towards me. But back at home, it wasn't long before her aggression returned and I was being bullied and belittled constantly. Me with my little girl, Emily. "You can't do anything right," she snapped. I felt like such a failure and walked on eggshells around Mum. Over the years I tried to leave on several occasions. But when my relationships failed, Mum would beg me to return and I always did. "Your dad's sick," she said. "We need you here with us." I guess part of me still longed to have a mother in my life the way other women did. By then, she and Dad were living in a home with a second, smaller house out the back. "It's your home now," she said, handing me the keys. I was in my 30s and figured I'd still have my independence. I could pop over for visits when I felt like it. But I didn't need to. Mum was at my door all the time. If I was on the phone, she'd grow suspicious. "Were you talking to your boyfriend?" she asked one day. Mum turned on me. I never understood why. "Ben* is just a friend," I said. "Why are you always talking to him?" she demanded. "Don't even think about moving out again." I tried telling her I didn't have a boyfriend, but Mum was convinced I was lying. One day I sat down for a bite to eat when I saw a shadow pass the living room window. I didn't think anything of it until three people burst inside. There was Mum with a family friend, Joseph, 42, and his girlfriend, Katherine, 22. Next thing I knew I was struck out of nowhere, and fell to the floor. A cushion covered my face, making it hard to breathe. "You're not going anywhere!" Mum yelled. Her hands gripped my neck, squeezing out the last of my breath while Katherine raised an iron bar and hit my head. "Stop!" I cried weakly, feeling myself drifting out of consciousness. Gathering all my strength, I tried to roll over and escape. But they taped my hands and feet so I was stuck on the floor. I'm going to die, I thought. Red-hot pain ripped through me. I felt blood oozing from my head. After 30 minutes of torture, I heard people outside. Joseph and Katherine leapt to their feet, trying to disguise what was going on while Mum tore the tape off me. All the blood had made her realise she'd gone too far. But there wasn't the slightest hint of remorse in her voice. Dazed and unable to understand what had happened, I tried to compose myself as they left the house. Your own mother did this to you! I thought, washing the blood off my face. Going to the police station, I made a statement before being taken to hospital and having seven stitches in my head. "You're lucky to be alive," the doctor told me. In court my mother, Elizabeth Pauline East, pleaded not guilty to entering a dwelling with intent to commit an indictable offence, assault occasioning bodily harm and deprivation of liberty. But the judge wasn't convinced and she was convicted and sentenced to 12 months in prison. For their part in the crime, Joseph was sentenced to 311 days in prison and Katherine to 352 days. I've still got no idea what prompted the attack. Mum told the court it was all over my supposed 'boyfriend'. But that was a lie – I wasn't even seeing anyone! As I struggled to come to terms with what had happened, I learned that while she was in prison Mum had found her way back into court. This time, she pleaded guilty to two charges of unlawful assault after groping a fellow inmate's breast and days later touching the woman's crotch with a walking stick. Despite everything she'd done, I wondered if Mum might have changed her ways, so when she got out of prison I sent her a letter in the hope of putting it all behind us and having the mother-daughter relationship again. We got on with our life, you do the same, she wrote in a Christmas card from her and my dad, who was by now extremely ill. Forget about us. The words broke my heart. There really was no hope for me and Mum after all. I've tried my best to move on after my attack but the scars still remain. I'm grateful I survived, but I'll never understand why any mother would put their own daughter through such hell.